Voice of Customer refers to peer-to-peer exchanges between B2B buyers on independent online and offline discussion forums. During these exchanges, specific solutions and products are discussed, recommended or warned against, often well before any manufacturers are consulted. The conversations online and in the marketplace tell companies everything they need to know about how customers perceive the company and its products. These conversations carry the highest level of believability and trustworthiness that can be achieved in today’s mass communication environments. A company’s key activity is to listen to what’s being said and respond accordingly. 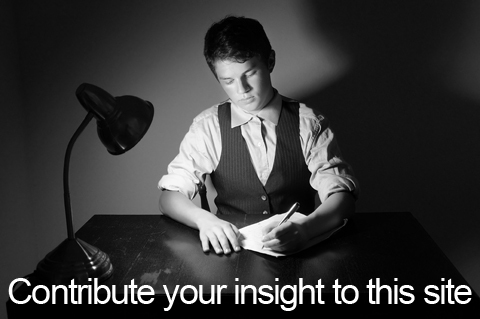 Voice of Customer is a key element of the Three Voices™ strategy. Whether you are just getting started or are all about social media this article is for you. Just as a boxer cannot win a fight with his hands tied behind his back, a company cannot maximize its online presence without a robust toolbox to support its social media strategy. A serious social media strategy cannot exist without the support of game-changing tools and, even more importantly, the right people to appreciate and leverage them (you). Is word-of-mouth best for business execs? Should B2B forget all about Facebook? We’ve had a “Voice of Customer” program for 10 years – is that good? The book “The Death of Propaganda – B2B Buyer Behavior Has Changed. Now it’s Your Turn.” co-authored by me, Michael Best and David Hoskin, talks about three concepts that are absolutely vital for B2B marketers to grasp: Voice of the Company; Voice of the Industry; and Voice of Customer. Communicating with all three of these voices is mandatory if you want to fully address the needs of the new breed of B2B buyer. Experienced marketers may feel a little confused about our use of the already established term “Voice of Customer”. Voice of the Customer is a term that has traditionally been used to describe special programs for involving customers in core corporate activities such as product development and the design of customer-facing functions. Such activities usually involve inviting key accounts or a cross-section of customers to special, offline events where they can provide direct input and feedback to management. Today, this type of Voice of Customer program is basically a dinosaur. A relic. An outdated idea that was only ever useful as a far-too-small plaster on a gaping wound in the way businesses were interacting with their markets. Enlightened B2B marketers now look past this type of program to get customer input on customers’ terms rather than those of the company. So, for the purposes of our Three Voices strategic model, we took over the old terminology and gave it a make-over, re-positioning “Voice of Customer” as the all-important conversations going on between B2B prospects and buyers about which solutions, and which brands, should be on their short lists. We recommend our B2B clients to have their ears firmly to the ground wherever such conversations are taking place – both online and offline – and to be ready to respond to salient topics and opportunities as they surface. “The Death of Propaganda” has much more to say on the subject, and I’ll try to make the new direction of Voice of Customer as a term even clearer in posts to follow. I’m going to talk about three concepts that form the pillars of the Three Voices™ strategic framework (described in “The Death of Propaganda – B2B Buyer Behavior Has Changed. Now it’s Your Turn.” and which I believe are important for B2B marketers to grasp: Voice of Company; Voice of Industry; and Voice of Customer. All three of these concepts are mandatory if you want to fully address the needs of the new breed of B2B buyer. I’ll briefly explain what each of these ‘Voices’ is and what role it should play in your work. 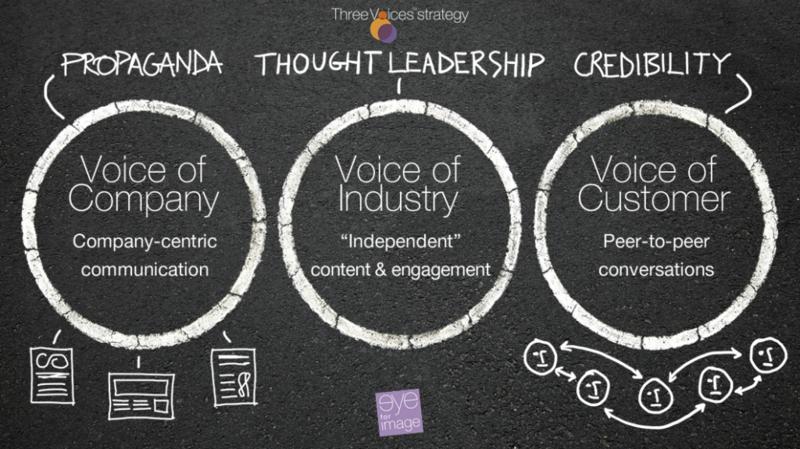 Three Voices Strategy™, in essence, is a stakeholder engagement model created by Eye for Image that stretches across all of a company’s audiences. 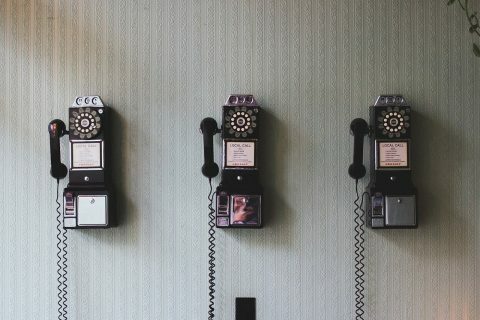 It rests on three original concepts that are vital for B2B marketers and communicators to grasp: Voice of Company; Voice of Industry; and Voice of Customer. The basic idea of Three Voices Strategy™ is probably best described on a paper napkin in less than ten minutes. That’s because the principles underlying it are relatively simple and can be communicated by drawing three circles, each representing one of the Voices as below. The circle on the left represents the Voice of Company. We use this as an umbrella term for messages and materials created by a manufacturer or service provider to describe its offerings to prospective customers. In today’s world of B2B marketing and communications, Voice of Company is also the home of corporate propaganda. The key strategic direction in this arena, as far as Three Voices Strategy is concerned, should be to reduce or eliminate propaganda-like messages and become a more credible entity that is seen to help prospects and customers to determine the solution that best fits their needs. Now let’s turn our attention to the circle on the right called Voice of Customer. We use Voice of Customer as a term to describe the peer-to-peer conversations going on between B2B buyers, discussing and recommending, or recommending against, specific solutions and products, well before the manufacturer is consulted. Here’s where all the action is, where the big changes in B2B buyer behavior have taken place, and where companies need to actively listen and respond if they are to match their marketing efforts to the new realities of B2B buying processes. Of course, historically “Voice of the Customer” (VOC) has been a term used to describe special programs for involving customers in core corporate activities such as product development and the design of customer-facing functions. Today however, we hear from our clients that this concept is fast becoming outdated, its practices have become too costly and its outcomes insufficient. In fact, these programs were a stop-gap measure that was only ever useful as a far-too-small plaster on a gaping wound in the way businesses were interacting with their customers. Enlightened B2B marketers now look past traditional Voice of the Customer programs to get customer input on the customer’s terms rather than those of the company. If Voice of Company is where most B2B companies are focused on today, and Voice of Customer is where they, in fact, should be focusing their attention, then the middle circle, Voice of Industry, should be seen as the bridge companies need to use to close the gap. By Voice of Industry, we mean the activities where the company seeks to influence its market and enhance its brand by discussing industry-level matters instead of directly pushing its own offerings. Typically, Voice of Industry activities encompass paid media (paying to place industry-level content on other companies’ media), earned media (being seen as a valuable content partner on, for example, an independent industry news site), and the all-important owned media (you own a content platform prospects and customers use to help them make decisions). A recent example of an owned-media Voice of Industry activity is A.P. Moller-Maersk’s “Let’s change the way we think about shipping” site, which encourages the container shipping industry to effect beneficial changes for a more viable future. Simply put, the ultimate goal of a properly implemented Three Voices Strategy is to move from the company telling prospects and customers “We’re great!” to having these audiences telling each other “They’re great!”. To get there, you need to build Voice of Industry activities, move from propaganda to credibility, and shift from being a salesperson to the role of customer advocate.